Last year wasn’t a great writing year for me. Nor a great reading year either. I think I lost faith in literature. I started to wonder what was the point of putting all these words down on paper or a screen, sending them out into the world while the world seemed in so many ways to be falling apart. And if I couldn’t see the point of writing myself, why would I want to read other people’s words? Or, if I didn’t want to read other people, why would I bother to write myself? I didn’t write, so I didn’t read. I didn’t read, so I didn’t write. The world continued to fall apart regardless. 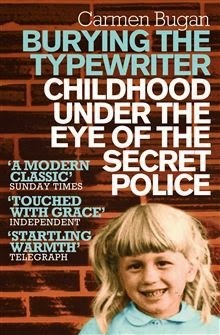 For Christmas I got Burying the Typewriter, by Carmen Bugan, from someone who didn’t realise I’d pretty much given up reading. In this memoir of Ceausescu’s Romania, Carmen Bugan's father bought two typewriters. One stayed on the living room table, and 12-year-old Carmen wrote poems on it. The other was a secret typewriter. Carmen’s parents dug it up and typed anti-Ceausescu protest leaflets on it all night. Every morning, they buried it again in the back garden. Ion Bugan went to prison for five years because of that secret typewriter and the words he wrote on it. The rest of the family was starved, ostracised, spied on and relentlessly persecuted by the secret police. The only teacher who dared show Carmen any kindness at school was her literature teacher, Lucia, who secretly gave her salami sandwiches. While I was reading these words, the British press was full of words about Romanians – words like job stealers, benefits scroungers. I wonder what Carmen Bugan, who knows what it is to starve, who has this astonishing faith in literature, thinks about those words; the power they have. I’m back to writing again. And to reading. I felt humbled by Burying the Typewriter. And stupid too, to have doubted the relevance of literature. Literature, love of literature, belief in its importance, can be a salami sandwich when you’re starving. It can be a prison sentence. The difference between a closed door and an open one, into another country, to a better life. The book sounds very powerful - thanks for writing about it - and here's to your year being better than last! An understandable response to all the continuing news and nastiness, Lily - but so glad for you that the book came to you. I'll look out for it. Wishing you and your writing - and reading - well. Thank you. We have so many words in our lives that it is easy to take them for granted. An inspiring and thought provoking post. Thanks - and good luck with your writing! thanks for the comments and good wishes all - have just finished writing, finally, a book I've been working on for longer than I care to remember! And now have a great big lovely stack of reading material lined up. This is such an interesting post. I'm going to try and look out for the book. I would like to tell my nephew's wife about it. She is originally from Romania, but it sounds interesting for anybody.